It’s that time of year again when thousands of individuals get together to push their bodies to the ultimate limit and see whether or not they have the stamina to complete in one of Okinawa’s most popular races. 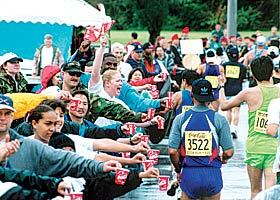 The 2002 Okinawa Marathon Competition will kick off at the Okinawa Comprehensive Park on Sunday, Feb. 17 at 9 a.m. and last until 3 p.m. The racecourse consists of much of Okinawa City and Kadena Air Base Gate 2 area, and the finish line is back at the Comprehensive Park. There are two races runners can register to enter, a 42.195 km (26.4 miles) full marathon or a 10 km (6.25 miles) race. Awards will be given to the top six male and female finishers in both categories, as well as to the top of each special age group of runners, the oldest male and female finishers, and the top male and female national finishers. Applications will be accepted until Sunday, Dec. 23 at 5 p.m. From Dec. 1 through 23, the Okinawa Marathon Executive Office will be open daily. The registration is limited to 15,000 runners. The registration fee is ¥3,500 for adults and ¥2,500 for those from 16 to 18 years old. Registration for the 10 km race is ¥2,000. The entry fees include insurance and a commemorative t-shirt or towel. Only yen will be accepted and no refunds will be given. If you are a part of a group of 15 or more who would like to run in the marathon, you can receive a discount of ¥200, on condition that all runners in your group must participate in the full marathon and have the same mailing address. For more information on the 2002 Okinawa Marathon, email info@okinawa-marathon.com, check out http://www.okinawa-marathon.com/index2-e.html, or call 098-930-0088. English speaking employees are available to assist in the registration process. Okinawa Marathon registration forms and other information are available at the Base and Camp MWR/MCCS Fitness Centers and Gyms, the Okinawa Marathon Executive Committee Office, the Ryukyu Shimpo offices, and Okinawa Television Broadcasting Co office. Those living in and around Okinawa City and in the Kadena Gate 2 Street area should be advised that traffic is restricted on the day of the marathon. It is advised to leave before the marathon starts if you have to be somewhere or wait until the event finishes.